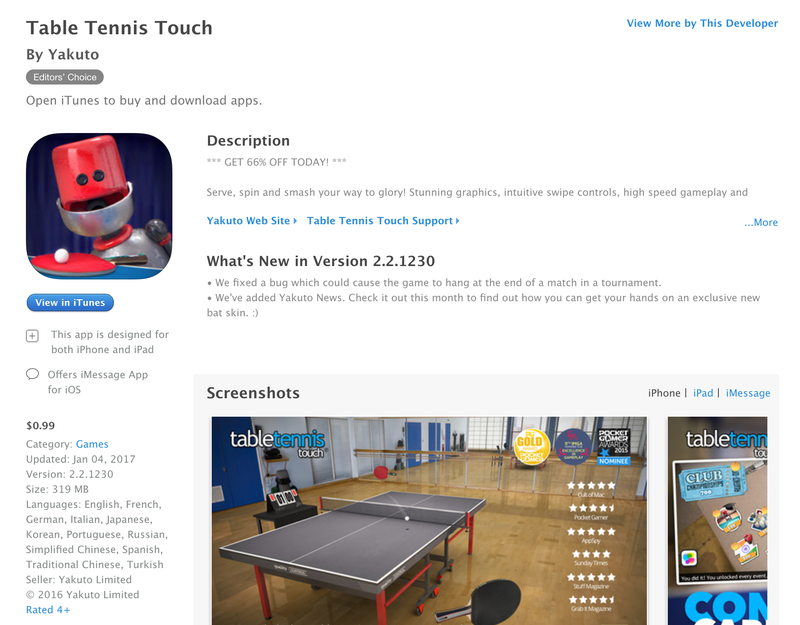 Table Tennis Touch for iOS is now available for just $1. Regularly listed for around $2.99, this is matching the lowest price we have tracked on the App Store and the first price drop of the year. It carries a 4+ star rating from over 1,600 users. As always, the rest of the best iOS deals of the day can be found in our daily roundups. Serve, spin and smash your way to glory! Stunning graphics, intuitive swipe controls, high speed gameplay and multiple game modes have made Table Tennis Touch the world’s #1 table tennis game. • MINI GAME FUN – 13 unique ping pong challenges including Half Table, Skittles, Accuracy Zones and more! • MULTIPLAYER – battle against friends in local and online real-time multiplayer. • WIFF WAFF – meet your training robot ‘Wiff Waff’. He’ll teach you everything you need to know. Due to the game’s high speed, Table Tennis Touch won’t run on the iPad 1, iPhone 4 or iPod touch 4th gen.